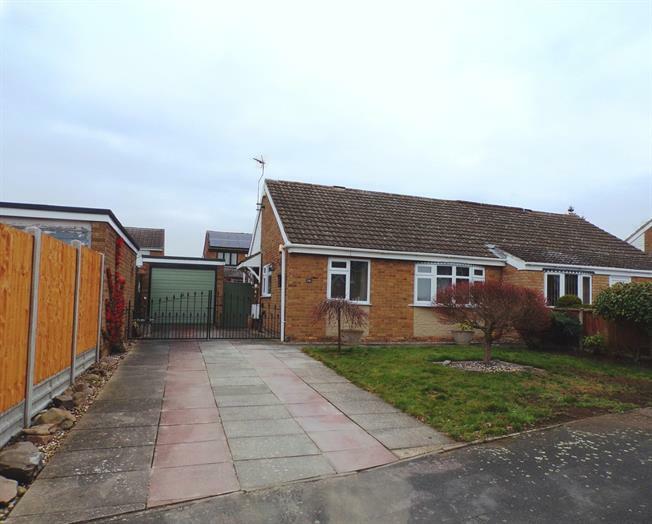 2 Bedroom Semi Detached Bungalow For Sale in Wigston for Guide Price £190,000. This lovely two bedroom semi detached bungalow is located in a cul de sac location in one of Wigston's most popular locations. The property is very well presented and maintained. Entrance hall, breakfast kitchen, lounge, two bedrooms, modern refitted shower room, enclosed rear gardens, driveway and single Garage. UPVC double glazed door, opening onto the driveway. Radiator, vinyl flooring. Double aspect double glazed uPVC windows facing the front and side. Radiator. Roll top work surface, wall and base units, single sink with drainer. UPVC bay window facing the front. Radiator and gas fire. UPVC double glazed door, opening onto the patio. Double glazed uPVC window facing the rear overlooking the garden. Radiator, vinyl flooring. To the front of the property is a lawned garden, paved driveway with double gates leading to a single garage with up and over door, power and lighting. The rear garden is enclosed by timber fencing and mainly laid to lawn, having deep borders filled with plants and shrubs, paved patio area, secure side gated access.